commercial asphalt paving Archives - RIMA Con Ltd. 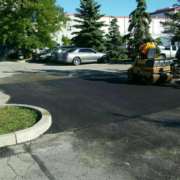 Whether your driveway just has a few cracks or is in dire need of a total facelift, asphalt paving is one of the best choices in materials that you can make. While another popular option is concrete which has certain advantages, using asphalt has its own significant benefits. Asphalt paving is often chosen over other materials predominantly for the following reasons. The climate and weather conditions in the GTA and surrounding areas are considerably harsh, both in the summer and winter when temperatures can go to extremes. Major fluctuations in temperatures can cause surfaces to expand and contract. Considering this fact, it’s important to choose a material for your driveway that will be able to withstand the elements without having to be repaired more often than necessary. Thanks to the flexibility of asphalt, this material can withstand such expansion and contraction while resisting cracks. In addition, the ability of asphalt to absorb the sun’s heat because of its colour allows snow to melt much faster on it, thereby cutting back on the amount of maintenance required. Asphalt paving is typically the most cost-effective option when it comes to driveways. In fact, it can be anywhere between 30% to 40% cheaper compared to materials such as concrete. This is one of the biggest reasons why many homeowners and commercial business owners choose asphalt as the material of choice for their properties’ driveways. Asphalt paving typically takes half the time to install compared to concrete. Of course, the size of the surface area that is being paved will impact the time needed to pave; however, asphalt is certainly an affordable option to consider compared to other materials. For minor cracks, asphalt paving can be sealed rather quickly and easily, and at a much lower cost compared to concrete. Other materials often require the entire area to be paved in order to make the necessary repairs and create a cohesive, visually appealing look that doesn’t appear as if it’s been patched up. At RIMA Con Ltd., we provide our valued clients with all of their driveway paving needs all in one convenient spot. We take care of the paving job from start to finish, including preparing the surface area and laying the necessary groundwork all the way through to final sealing. We have the necessary experience, training, and skills in asphalt paving to transform your current driveway into a high-quality and attractive one.